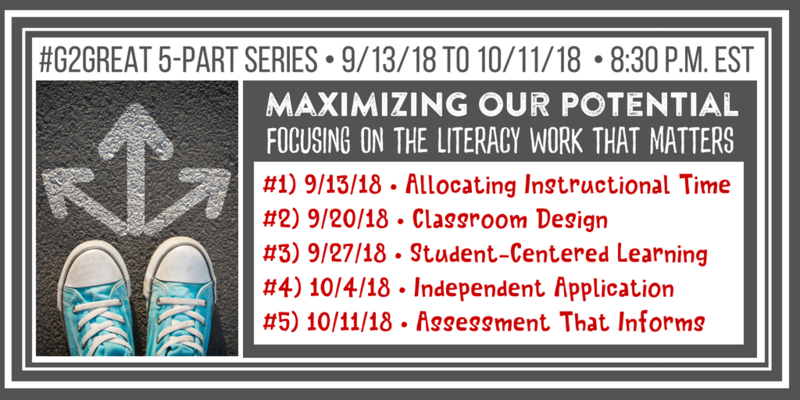 On 9/20/18, we were excited to continue our five-part #G2Great series: Maximizing Our Potential. In part 2 of the series we turned our attention to Classroom Design. Knowing that our design choices are instrumental in “maximizing” the quality of our efforts, a passionate two-pronged discourse ensued. 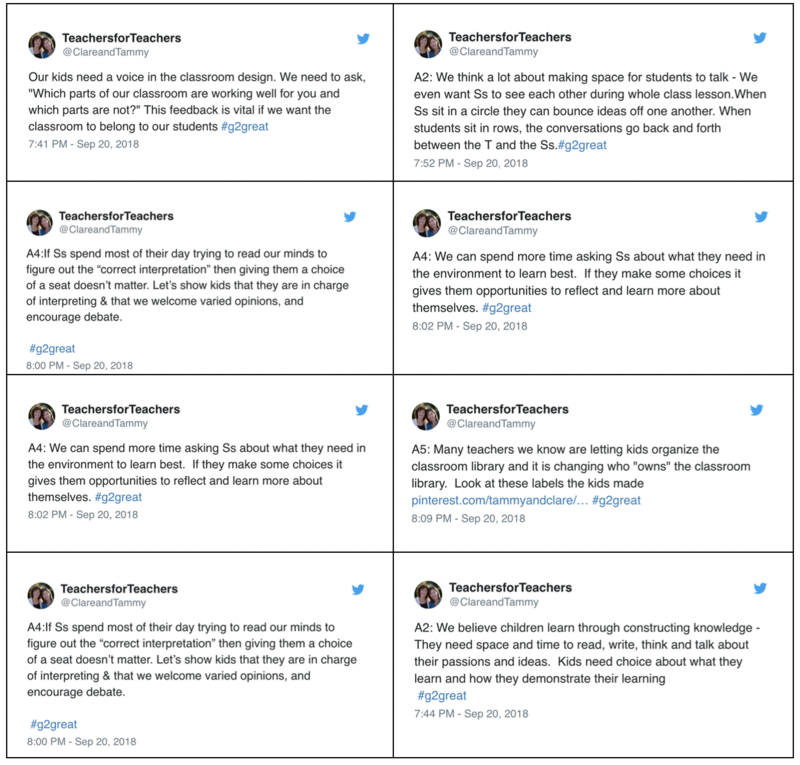 We quickly began contemplating the design factors that could enrich the teaching-learning process while acknowledging inevitable roadblocks that can deter our efforts. The topic of classroom design often goes to a default view focused on the visual appeal of classrooms such as furniture or room arrangement. There have been many books on this topic and there are even Twitter hashtags that celebrate Pinterest-worthy photographic displays. While these images are intriguing, we were committed to broaden our dialogue beyond mere physical design. 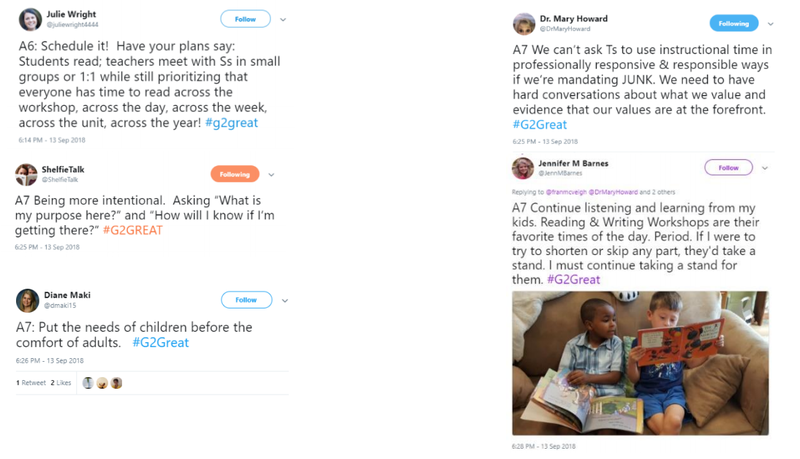 Early twitter trending demonstrated that our #G2Great family was just as eager to explore a loftier design view. This first design essential is easily captured in still photographs as we look at the physical features of room design. This visible design is important since it’s the first thing students see when they enter a room and it surrounds their visual field all day. Just as we create our own living spaces that beckon us to enter, our classroom design should entice children into a safe and welcome space. 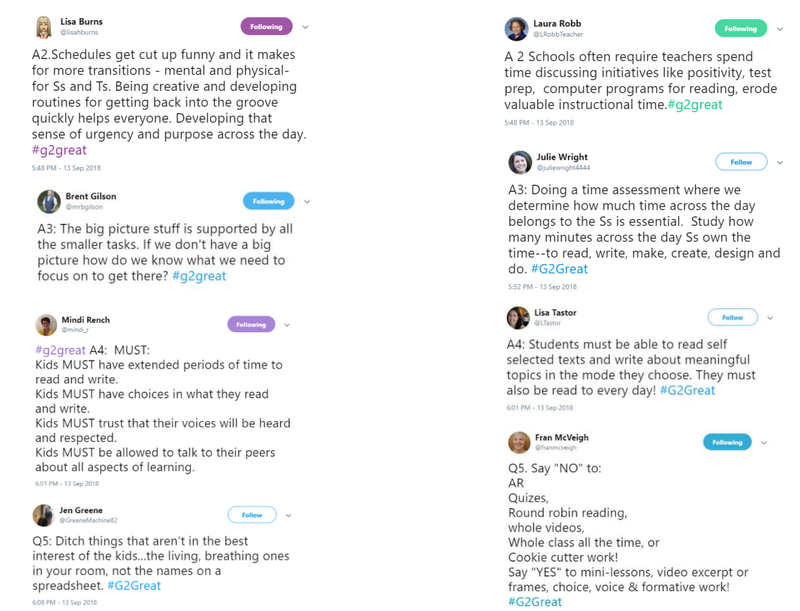 Since we have a wide range of unique learners, we offer a wide range of unique seating options that afford opportunities to work alone or with others, most often by choice. 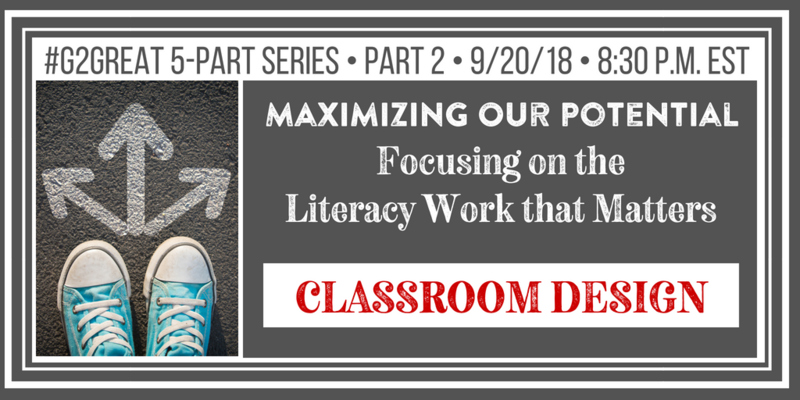 This is not about the wiggle seats, colorful pillows, or tables with legs cut off but how those things match the learning needs of the children who inhabit these spaces and the engaged literacy that will take place in the name of students learning. We know that the traditional image of neat desks in a row leaves little room for children to stretch out or collaborate comfortably and so we create a space that is appealing to the eyes but also to the mind and body. We create gathering areas where teachers and children can work together in a more intimate setting during whole class, small group and side-by-side learning. We put a great deal of time and thought into the heart and soul of this design: our classroom library. We view our text collections as the driving force of our design, making it visually appealing as we highlight quality resources with easy access. We co-create learning walls where children assume a starring role through celebratory displays reflective of their engagement in learning, devoid of the red marks, stickers or happy faces that simply label children and reflect approval over appreciation. We make sure that what visibly surrounds them also cognitively and emotionally energizes them and we create precious opportunities to make them active participants in that learning. 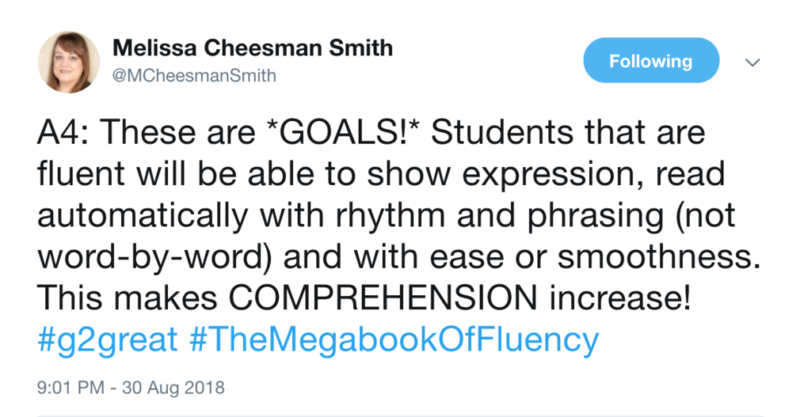 These goals acknowledge visual appeal while putting students’ thumbprint in that design. This means that we make our students active participants in a space that works for them as they take ownership of these spaces. Once we create an inviting visual space that nurtures and supports our work with children, we begin to move from sights to sounds that emanate from those spaces. Student-centered classroom design means that we are willing to relinquish responsibility to our children over time. The central feature of this shift from teacher to students revolves around the voluminous talk that we willingly lift into the learning air so their voices rise above our own. This meaningful, productive, authentic talk reflects the quality of talk that is central to our own lives. 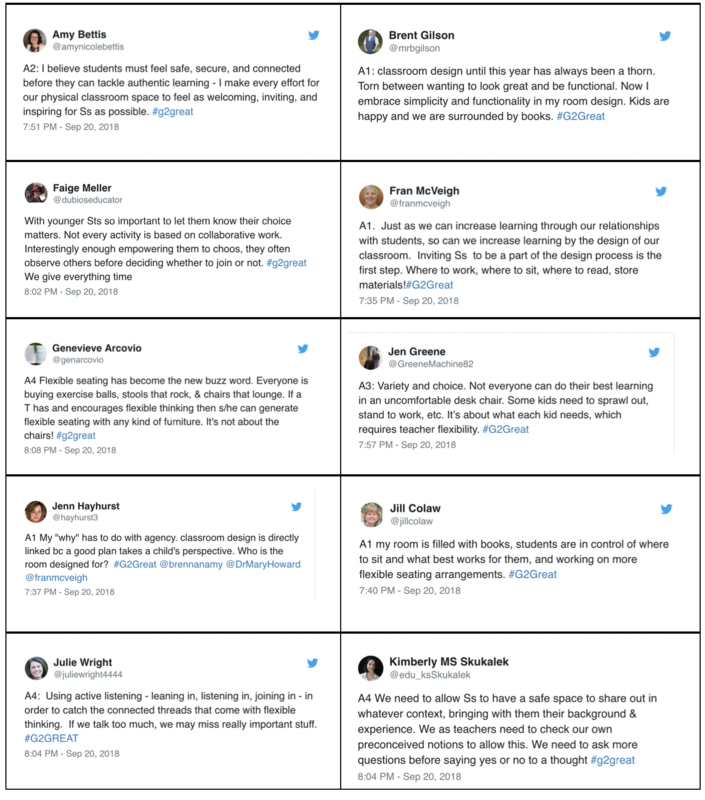 We want talk to flow from our gathering spaces where the teacher offers real life instructional talk opportunities and then invites students into a shared dialogue. We use read aloud and shared reading to build a bridge from student to teacher talk with teacher modeling and think aloud. Within these opportunities we intentionally plant talk seeds as we invite children to the talk table to nurture that role. 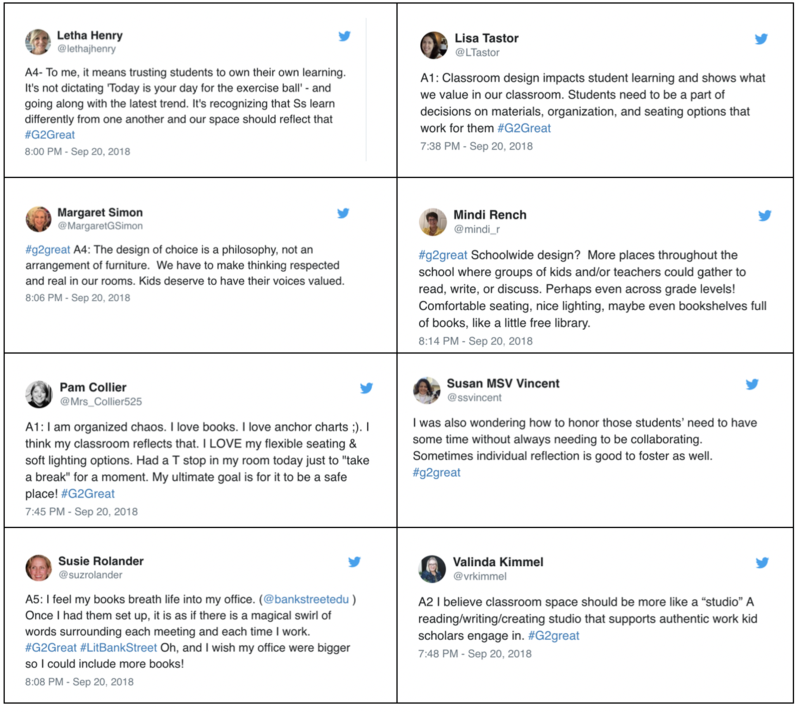 In a student-centered design, we welcome them to the conversation as we avoid scripted question interrogation and opt for a spirit of open ended wonderings that celebrate their thinking. We welcome their ideas as we begin moving along our talk bridge from teacher supported to student engaged talk. We strengthen that bridge as we offer varied small group and side-by-side experiences where two-way dialogue continues to honor student thinking until it becomes business as usual. 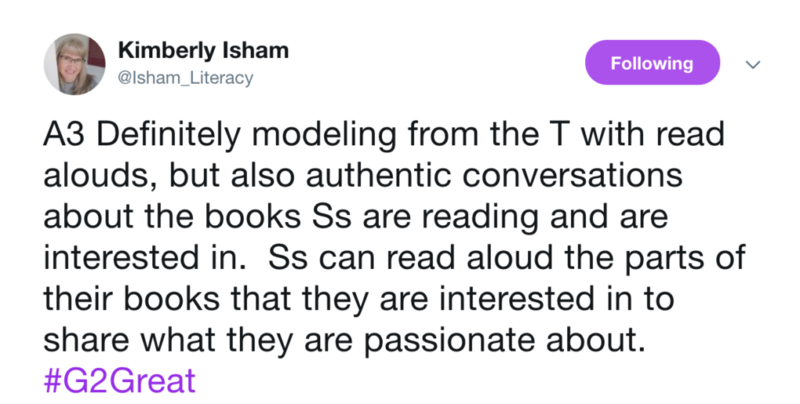 Finally we gradually relinquish this role to students as we make room for them to form partnerships and collaborative experiences where they can engage in reading, writing, talking and creating without the teacher. At just right moments, we are then wise enough to assume a secondary role as we soak in the soft buzz of conversations that occur without us and encourage them to apply the authentic dialogue we set into motion using wonderings that rise from interests and passions. We recognize that this is an opportunity to offer support as needed but we also give them the room to grow. We become curious kidwatchers by noticing and gathering our in-the-moment assessments that may lead to whole class, small group or side by side support but continuously promote independence. We immerse children in talk until we are no longer needed and willingly step aside as our learners become our teachers. 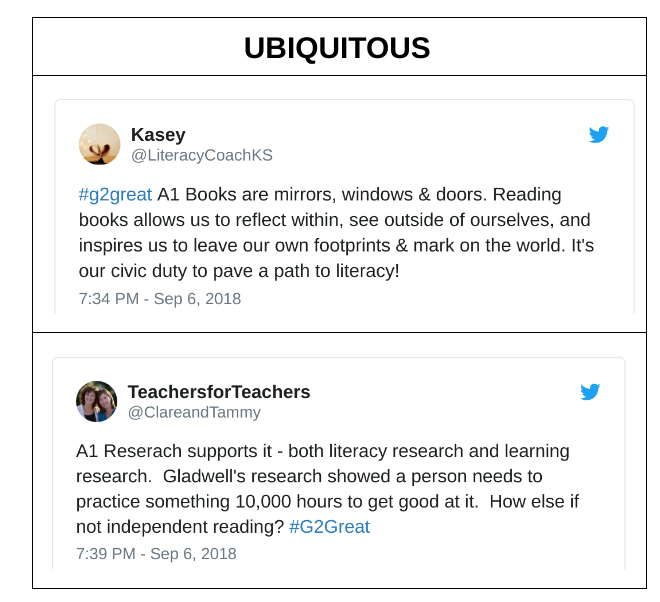 As we look at our third design essential, I want to emphasize that each one works in tandem and is both individually and collectively a crucial feature of powerful classroom design. What children experience is active engagement in the process of learning, both with and without the teacher. Students quickly become active participants as we place the reins of learning in their hands. While we continuously design instructional experiences for children, we also leave ample space for them to take over. 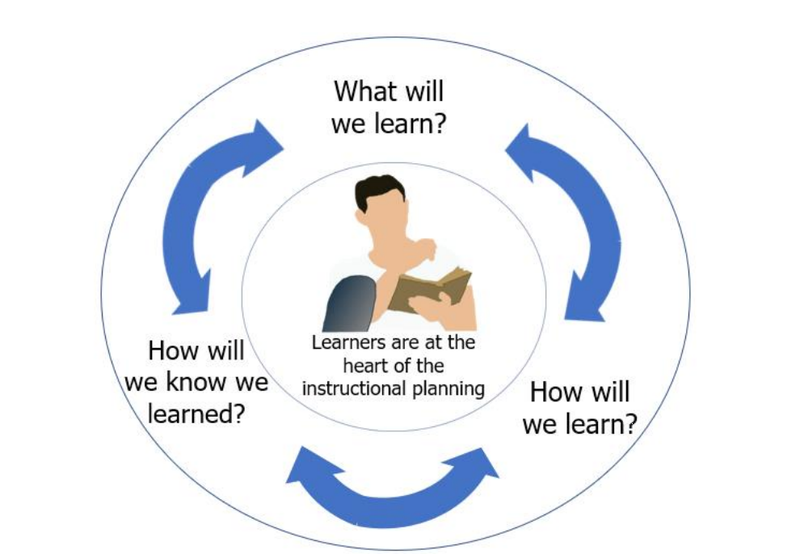 We make instructional decisions but we also acknowledge that choice as a critical part of these experiences and is present in all aspects of this design. 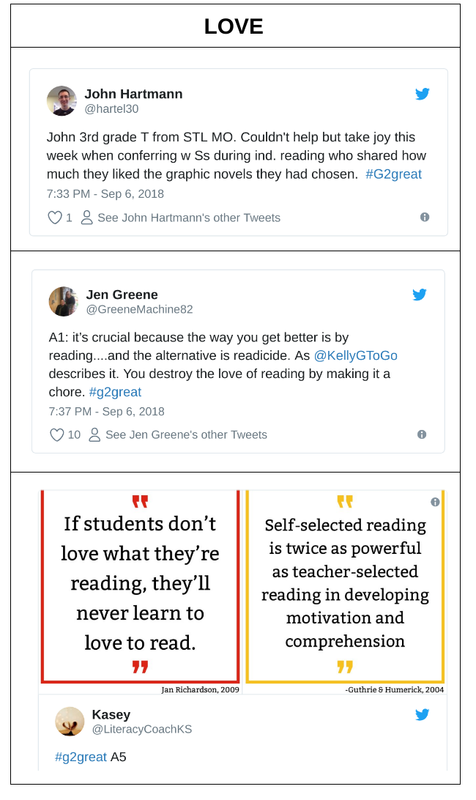 Students choose the texts that they want to read and where they will read them. Students choose what they want to write and whether they will work alone or with others. 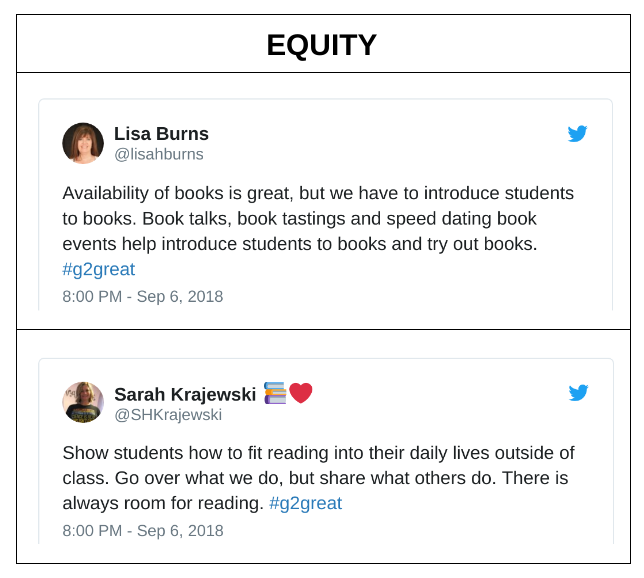 Students choose the kind of collaboration they will do with partners and within small groups of peers as we encourage them to initiate their own book clubs, writing partnerships, or student selected explorations that draw from those interests and passions. 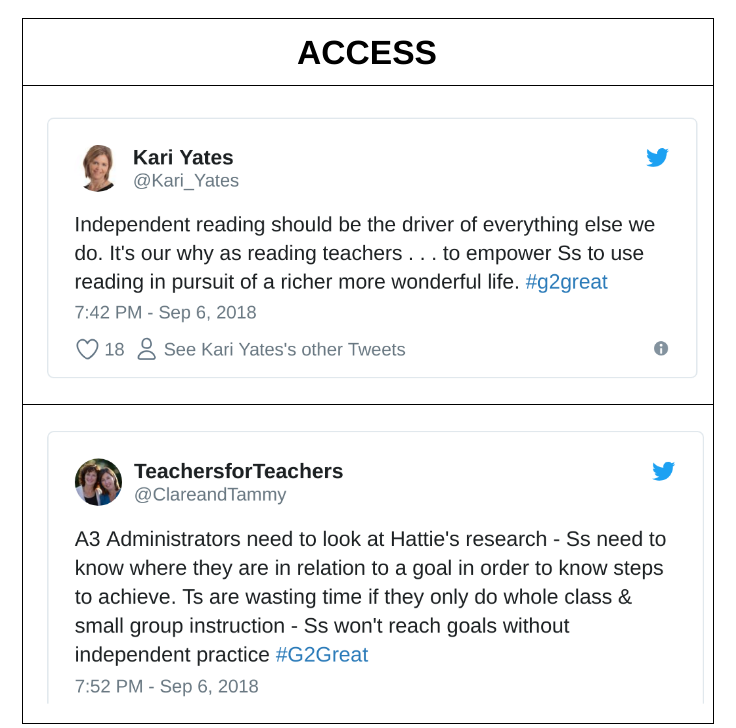 We continue to offer models and instructional supports that elevate and escalate these opportunities using supportive rather than dictatorial experiences and we gradually hand over primary responsibility from teacher to child. We demonstrate by these opportunities that we trust students to work without us given the foundation we have put into place as we support and observe children in action by meeting them where they are. We can only truly create student-centered classroom design when we have the courage and wisdom to wait in the wings watching the sparks of learning fly. We acknowledge and celebrate the learning experiences that occur when we are no longer needed. I intentionally saved this fourth design essential for last. While it also works in tandem, our ability to achieve this final point may well reflect our overall success. Our ultimate goal is to create joy-driven engagement, knowing that children stand to learn most when they are happy, feel successful and are central to this success process. We use our assessment of this essential feature to determine our own success, recognizing that what we hope to accomplish from our side of the learning process and the impact this has on our children from their side of the learning process may be at cross purposes. 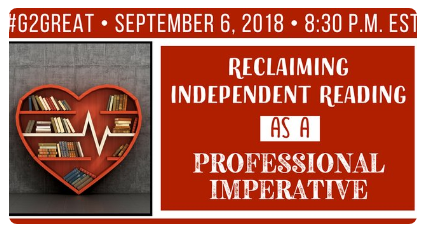 We begin by building relationships, both teacher to students and students to students, knowing that this is the foundation on which all else stands firm. We do this by creating a classroom design that nurtures a safe environment, again not just from our eyes but from theirs. We see this in their faces as well as how they actively engage in the learning process. We know that fill-in-the-blank forms and controlling activities diminish this emotional aspect of learning and even minimize the potential for that learning so we choose not to use them. When we see evidence that we have achieved this final design essential, we know that we have made students active and respected members of a learning community where teaching is not what we do TO children but what we create WITH them. And only then do we have a classroom design with our children in mind. This is the design that children will still remember long after they have forgotten what color your walls were, what kind of chairs you bought or where you put the collaboration bench. We have now added the human factor where learning is a joyful, engaging, collaborative, respectful experience. And this is the defining moment when we know we have a classroom design children deserve. When we combine these four design essentials, we recognize that everything we do has a specific purpose and always for the sake of our learners. 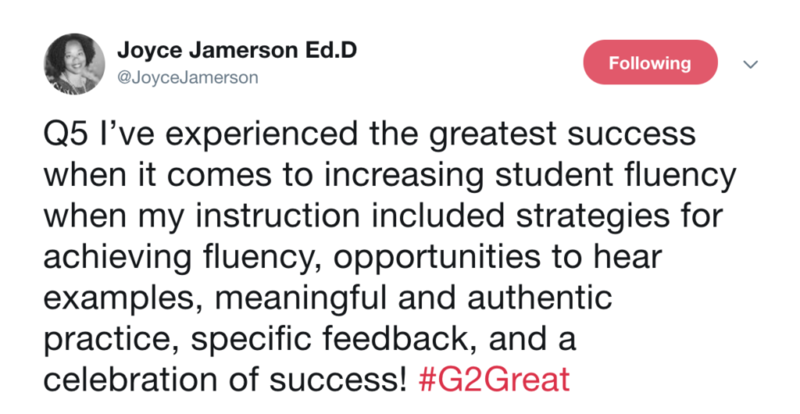 And what makes this realization of student-centered design even more powerful is that we now acknowledge that the precise design that worked for these children this year may not work for those children next year or the year after. Design that is student-centered rather than teacher-driven matches the children we have at that moment in time so it is a never-ending design process. As I come to the end of my post, I want to draw your attention to the way I named each design essential by using the word THEY vs. WE. Regardless of how well-intentioned our design may be, intent and reality may be at odds when our measure of design success is from our eyes rather than theirs. 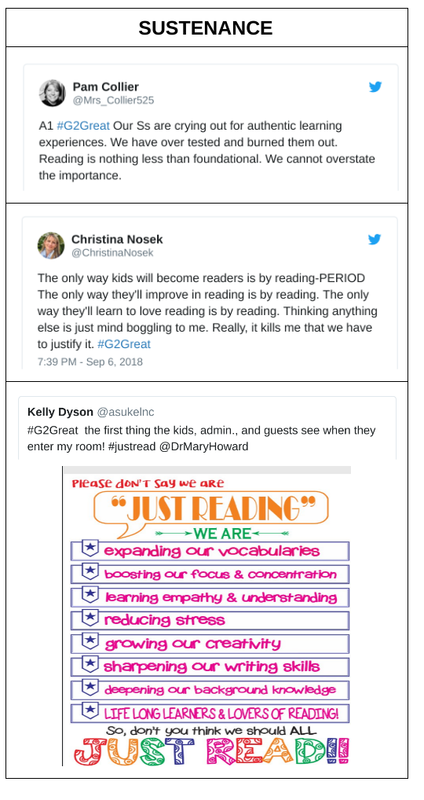 On August 30, 2018 #G2Great was delighted to welcome, Dr. Timothy Rasinski and Melissa Cheeseman Smith. 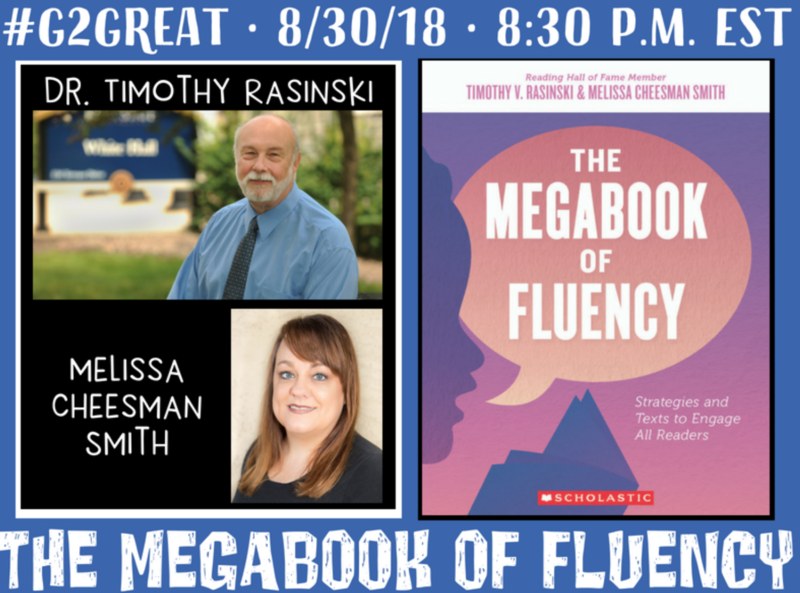 Tim and Melissa are fluency gurus who have so much to teach us all. 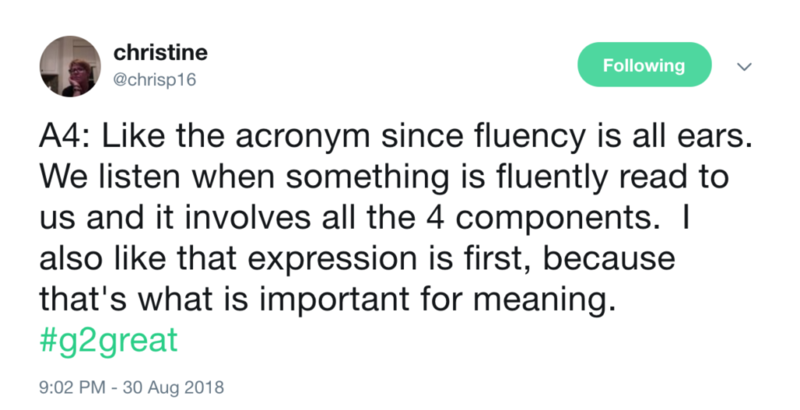 Why is fluency so important? Fluency is one way that children begin to believe in their reading prowess. I use the word prowess because it implies skill or expertise and it also implies courage and bravery. 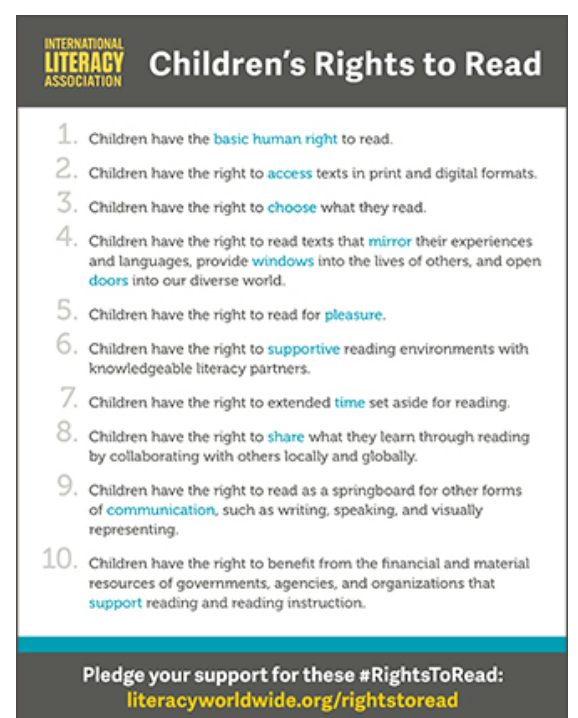 When children enjoy reading and become more skilled; reading becomes a source of joyful learning that builds them up and helps them to take future reading risks. Risks that will push them outside of their comfort zone into overdrive to their growth zone! 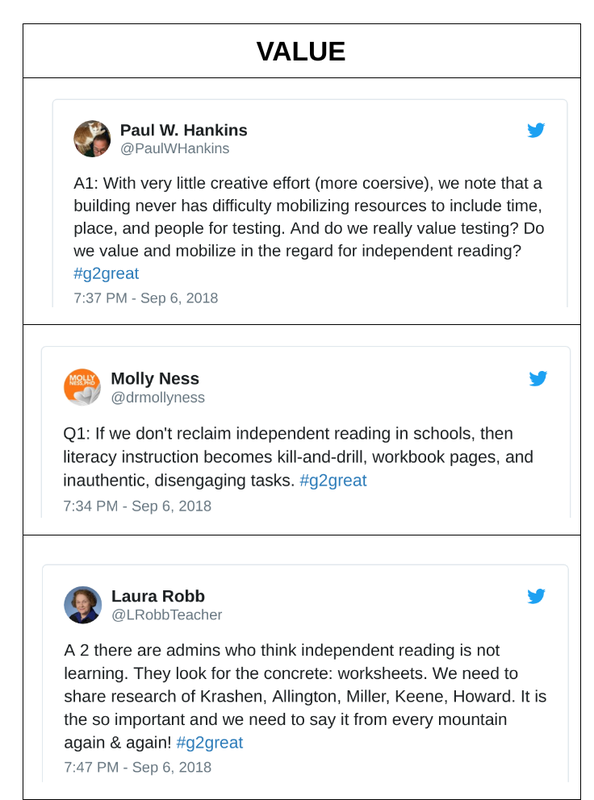 Yet, as part of our shared literacy history, fluency instruction got a speeding ticket. We began to focus our assessments and instruction on speed alone – and as anyone who has ever gotten a speeding ticket will tell you, we pay dearly for that mistake. Our conversation Thursday night mapped out a route for the complexities of fluency instruction. Our destination? 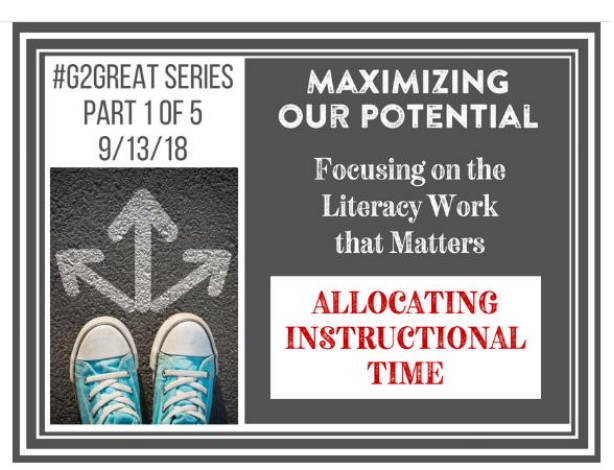 To strike a balance on the elements of fluency so our instructional practices not only meet children where they are, but gets them where they need to go. Road signs are a quick and efficient way to communicate important information. 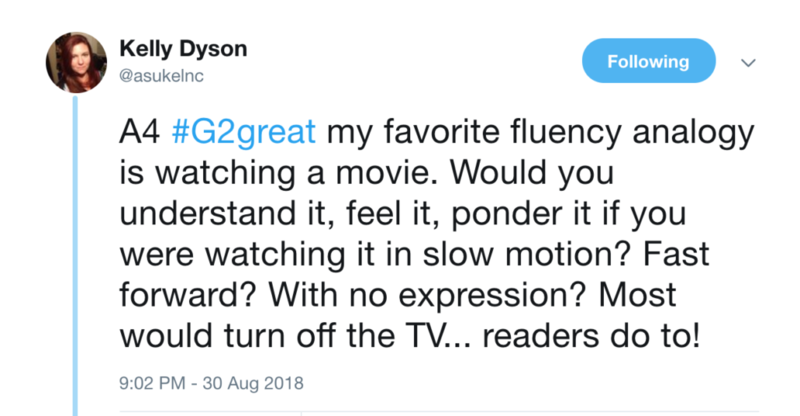 Tim & Melissa gave us this powerful instructional device, “EARS” to underscore the elements of fluency: Expression, Automatic Word Recognition, Rhythm & Phrasing & Smoothness. 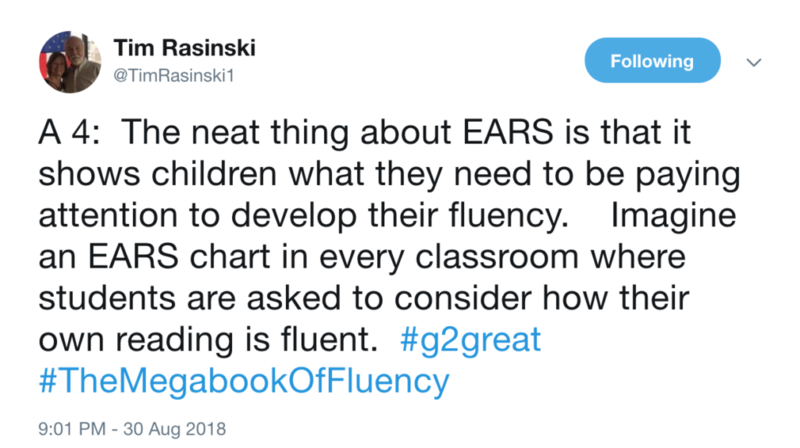 This tells our students the essential information they need to think about when working on fluency while reminding them to be all EARS! Speed has loomed large in the rearview mirror because for so long we been advised to keep fluency success dependent on words per minute. Ironically (just like driving a car) keeping a free and open perspective is what we really need. We need the whole picture. 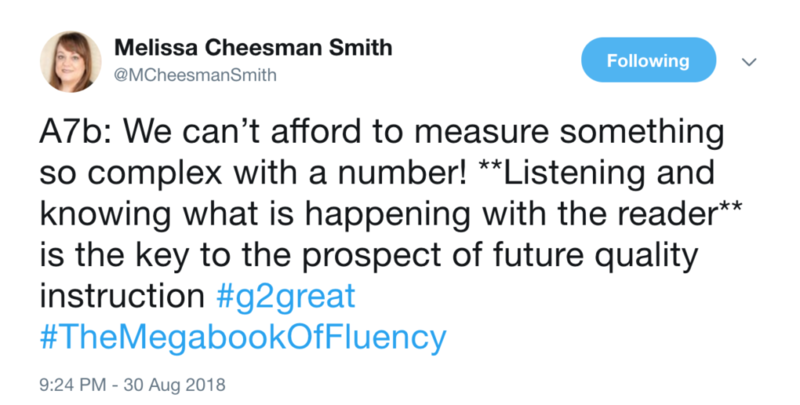 So while fluency has been seen through that quantitative lens of speed, Tim & Melissa have given us a revised Multidimensional Fluency Scale. One that rewards good drivers (a nod to Allstate) and that reflects a qualitative lens. Thank you so much for joining us, Tim and Melissa! It was a fantastic night and an excellent journey. If you want to learn more from Tim and Melissa please follow these links. You will be glad you did!